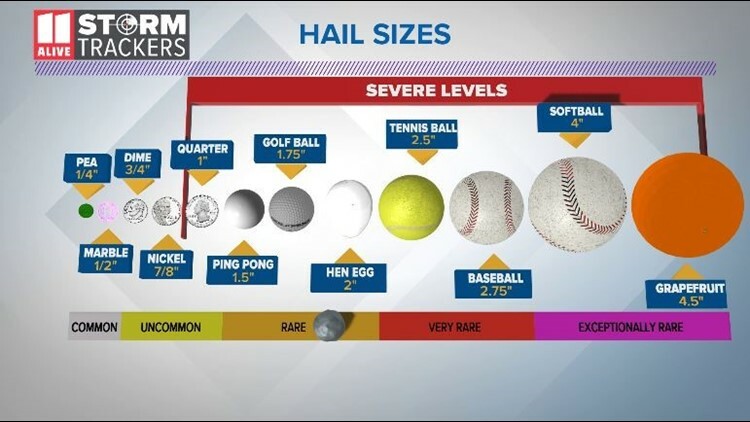 TEMPLE, Texas — Central Texas is facing the potential for seeing hail, but before that happens...how does hail form, anyway? It all starts with warm and moist air lifting, otherwise known as an updraft, followed by the cold, downward-moving air—that's our downdraft. As the warm air rises, eventually the air cools and condenses. If the updraft is strong enough, tiny water droplets will lift above the freezing level, causing the liquid droplets to become ice. The stronger the updraft, the longer the ice can stay suspended in air, allowing it to grow larger and larger until gravity takes over. It hits the ground as hail. Just in case you were wondering if this ice melts on the way to the ground, the answer is yes, which is why the ice shrinks down in size. So, the ingredients needed for hail are lift, instability and moisture. ► Get real-time breaking news and severe weather updates. Download the KCEN6 app now. Let's freeze things up right here. As we mentioned, the ice particles will continue to grow as they are suspended, but as it hits the ground, it will melt slightly. So what sizes of hail can we see? Generally, pea-sized and dime-sized hail are not threats to property, and are not considered to be severe. However, once the size gets to that of a quarter or larger, it becomes property-threatening, and is labeled as severe. The smaller-sized hail is much more common in our area, but tennis ball-sized hail – typically very rare – actually rained down on San Antonio almost three years ago in early April 2016, causing billions of dollars in damage.